Edit, Oct. 16, 2013: Rob Donohue discusses how approaches and skills differ, and why you need to look at them in a different light. 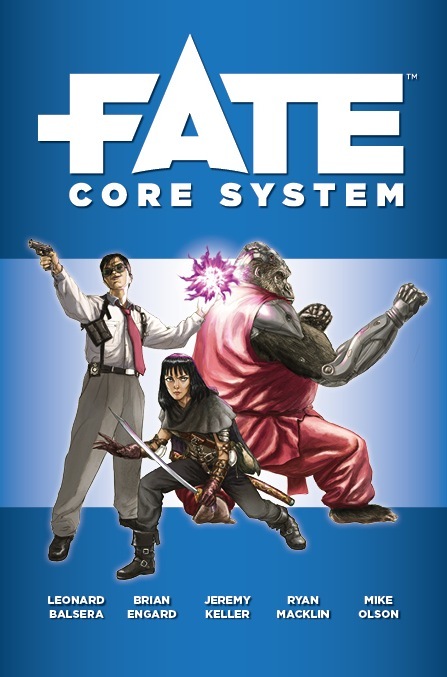 In my recent review of Fate Core and Fate Accelerated Edition (FAE), the standard and streamlined versions of the Fate role-playing system, I discussed how FAE’s use of Approaches differs from the use of Skills in Fate Core. I even argued that this made FAE a more faithful adaptation of the Fate “pillars”, Competence, Proactivity and Drama. The latest post in my current series showing step-by-step how I use FAE to adapt a literary setting discussed using the FAE (and Fate) mechanics to model specific features of the Budayeen setting from George Alec Effinger’s Marĩd Audran series, a Middle Eastern cyberpunk version of New Orleans’ French Quarter. This post attracted a number of questions on the use of Approaches, as well as on the role of Aspects; many gamers are still left somewhat confused on how Approaches fit in adapting specific settings to FAE, and exactly what they represent. Here are some more thoughts to help clarify the issue. While this post fits in with the Budayeen adaptation series, it addresses a more general context applicable to any game you plan using FAE — and, I think, Fate Core. You may have heard the Fate system described as “fractal” because you can use the same methods at different scales. People usually refer to more specific rules mechanics, and we’ll discuss them further when we talk about the “Bronze Rule”; but in fact, Fate’s fractal or scalable nature applies throughout. Fate Core’s Golden Rule (p. 185): Decide what you’re trying to accomplish first, then consult the rules to help you do it. While this rule is first brought up when discussing the Game Master’s job during play sessions, it actually describes most of a GM’s job right from the moment you decide you’ll run a game. Specifically in setting creation, adaptation, or conversion, you need to set clearly what you’re trying to accomplish in order to use the rules effectively to do it. In my Budayeen example, my goal is to create a game setting that will provide the feel of Effinger’s Budayeen stories in a game powered by the FAE system. Maybe I should call it Step 0: Goal, since in started my example with Step 1: Inspirations. Most of the time when I work on a game setting that borrows from literary fiction, comics, movies or television, this fidelity to the setting is going to be part of the goal. However, there are occasions where a GM may try to model other features; in particular, sometimes a GM wants to replicate the feel of another game system. For example, maybe you’ve been running a campaign in another system and you’d now like to port it over to Fate. Or maybe you’re creating a whole new campaign, but your players are die-hard fans of another system and you’d like to make this look as familiar as possible. These are all fine and achievable goals, but unless we make them explicit, articulate them clearly right at the beginning (Golden Rule), it will be very hard for two people to have a clear discussion if their implicit goals are different. 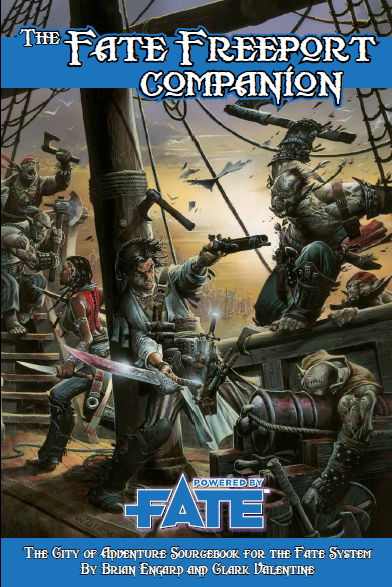 This weekend we were just provided by a valuable example of a game where other systems have an impact: Green Ronin just pre-released the Fate Freeport Companion for their signature setting, the fantasy/horror pirate city of Freeport, the City of Adventure. 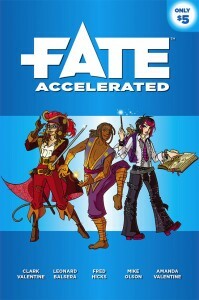 The book was available at the PAX convention and the PDF was released to backers of the Fate Core and Freeport Kickstarter funding campaigns. Green Ronin’s Freeport was the first setting ever released for D&D 3rd ed. back in 2000. In 2007, it was also released as a lovely system-less sourcebook (which I reviewed here); since then, companion books have released for a variety of systems including True20, D&D 3.5, Castles & Crusades, Savage Worlds, Pathfinder, and probably others. Now the Fate version is here. The most notable feature of this Fate Companion is that is essentially uses the streamlined FAE version of Fate but substitute six “Skills” — Strength, Dexterity, Constitution, Intelligence, Wisdom, and Charisma — for the six standard FAE Approaches. They are not “skills” in the same sense as Fate Core’s Skills, but more of a mid-point between the latter and FAE’s Approaches proper (Careful, Clever, Flashy, Forceful, Quick, and Stealthy). Most gamers will recognize them as the base characteristics or attributes in most games derived from the ancestral D&D. Also this weekend, Teo Tayobobayo posted a series of very attractive FAE character sheets to adapt movie settings like Star Wars and post-apocalypse fiction. As an alternative to the standard Approaches, each offers a version that uses the Strength, Dexterity, Constitution, Intelligence, Wisdom, and Charisma base characteristics. Is there any setting or mechanical reason to change the Approaches to these six “Skills”? I can’t think of any, and because I rarely play D&D variants anymore, it would not have occurred to me to make this change. However, if you’re converting existing material published for one of these other systems, or if you’re trying to entice your players to try Fate and they’re more comfortable with D&D variants, this may be a great idea. 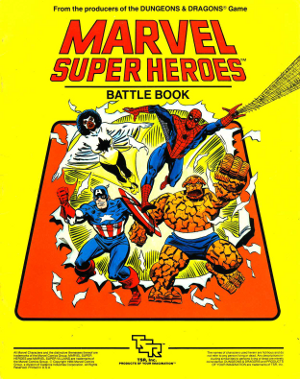 If you were trying to convert from the old TSR game Marvel Super Heroes, you might decide to use Fighting, Agility, Strength, Endurance, Reason, Intuition, Psyche — the seven abilities that earned the game its nickname of FASERIP. Do you want to do the same for every conversion? That depends on whether fidelity to another system is part of your Step 0: Goal. If the ONLY reason to use a certain list of Approaches is fidelity to another game system, ask yourself how necessary this is. It’s possible that it will make less work to adapt previously published material, but it’s also possible that it will leave your thinking in a rut and detract you from using FAE to its fullest. Despite the similarities, FAE Approaches are not used in the same way as base characteristics or skills. Yes, there are guidelines for use (FAE p. 18 for example); but guidelines they are, not rules in their own right. Approaches represent a character’s style, not the character’s ability. Imagine a sword fight, for example; I’m not going to ask my players to roll Forceful for every action that makes use of the sword because a swashbuckling musketeer like d’Artagnan might using Flashy for a manoeuvre, while the calculating Aramis might Cleverly use a new strike move he has developed. A ninja-like figure might use Stealthy to strike unseen from the shadows, etc. The strength of Fate Core in general and Fate Accelerated in particular is that it opens up your options to anything the character might reasonably do in a work of fiction, while providing you simple and organised rules to adjudicate the results in a way that will support a dramatically satisfying adventure. That’s not to say you can’t use the alternate Approaches, merely that you should think about how you’re going to use them to provide the tone and flavour you want in your campaign or episode. Most of the time, I don’t actually want to bring baggage over from another game system to encumber Fate. However, I can think of cases where I would actually do that, and in a later essay I hope to develop an example: Skyrealms of Jorune. 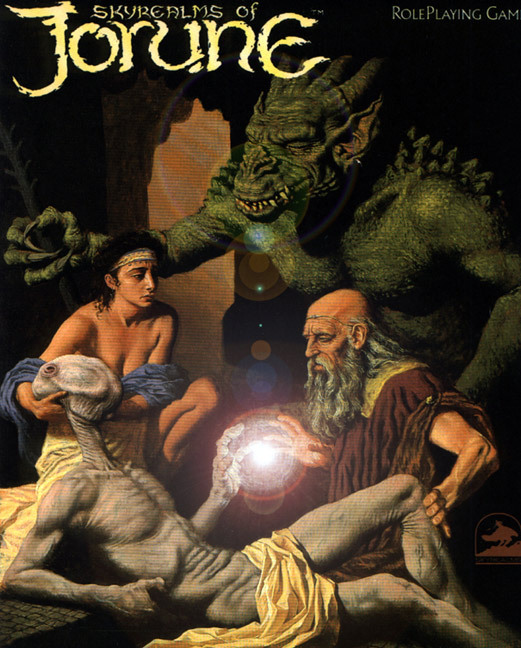 Jorune was a fascinating science fantasy setting published in 1984 by Skyrealms Publishing with a clunky system, then again in 1985 and 1987 with a second clunky system, and finally by Chessex in 1992 with a third clunky system. It’s not remembered for its mechanics, but for the rich setting written by Amy Leker and Andrew Leker, and beautifully illustrated by Miles Teves. As far as I know, it’s unlikely that we’ll see a new edition with a modern system because of complex issues of copyright ownership. Posted on September 2, 2013 December 27, 2014 by mechanteanemonePosted in games, rpgsTagged books, Budayeen, cyberpunk, fantasy, faserip, FATE, Fate Accelerated, games, george alec effinger, how-to, jorune, marvel, reviews, rpgs, scifi, supers. Previous Previous post: Gamer Food! There is always going to be an additional layer of complexity added to any attempt to convert Jorune, in that you will always need to come up with an additional set of rules to govern the regular motions of the 6 (?) moons which regulate the various “flavors” of Isho as well as rules for Isho “weather”. This was handled with a fair bit of elegance for its time in the original Jorune, but just coming up with charts and rules would probably double the complexity of FAE in itself. You can’t really work around them and hope to get the correct “feel” of Jorune magic though. Oh shut up! I’ll play a Boccord anyhow. The fellow who ran the Golden Sky Stories kickstarted is creating a Space Patrol FAE inspired game. He renames the Approaches to something more appropriate for the Space Patrol. He calls them “Skills” and reduces them from 6 to 5: Action, Cunning, Heart, Investigation and Science. Looking at it, he’s forced you to use Action or Cunning for combats, and the others really narrow focused. If it works for them, they’re doing it right, but I would be less attracted to this flavour than the openness of FAE proper. Freeport’s method is similar to how we did skills in Tales From Kausao City. Instead of abilities/attributes, however, we used professions, which function kind of like classes. It’s a middles ground between the simplicity of approaches (only have 6) and the crunchiness of skills (having predetermined and specific uses). I feel that’s the best way to play Fate. Rules “lite-ish” but with a definite direction for what does what. Same comment here I made above: I hope it turns out great, and of course I have not seen the drafts, but based on this description I would have opted for the more open Approaches if I’d been writing a similar game. On the other hand, if players and GMs are having fun, then it works. Well put analysis of the Approaches and Characteristics. I would be fascinated to see what you have on Jorune. This was interesting stuff. I’m planning a Firefly – inspired campaign using a hybrid Approaches + Skills mechanic. You pick a Skill you want to use (ranked from 0 to +2) and then choose how you want to use it by selecting an Approach (ranked from 0 to +2). Or vice versa. Add the values and roll. If you don’t have a Skill at all, it counts as a -1 modifier or can’t make the attempt, depending on what you’re trying to do. So a “0” rating has some value. We’ll see how it works. My group played Diaspora and some got the hang of it while others didn’t, so I wanted something halfway between Fate Core and FAE.